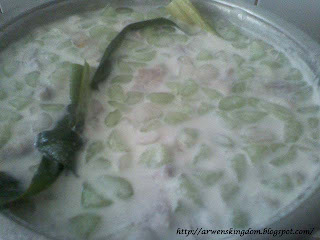 I am a big fan of Bo Bo Cha Cha (Bubur Ca Ca) but not those from outside but from own home made. I was a great mood and good appetite on Sunday yesterday morning. As usual, going to my the other Mother's (auntie actually) house after having a bowl of 'Mee Sapi', so called beef noodles some where around Sekama Road. 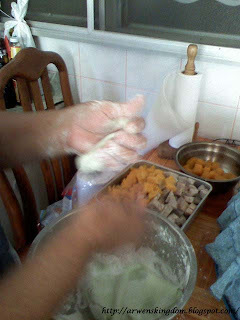 When I reach the house, I smelled 'Santan' (coconut juice), sweet potatoes and I am sure that auntie is making something that I like again. She is a great cooker and I learned most of the cooking secrets and skills from her. She made good Bo Bo Cha Cha as well. I walked in and I saw she is busy on it already, well...am not too late still to learn though. 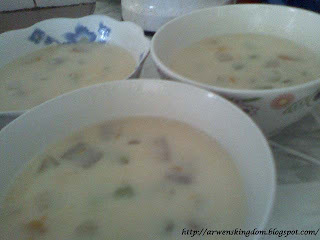 Three ingredients that had been steamed and nicely separated place on table. 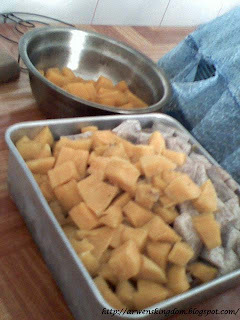 Pumpkin, yum and sweet potatoes, chopping it into cube and steam it until it cook and soft. 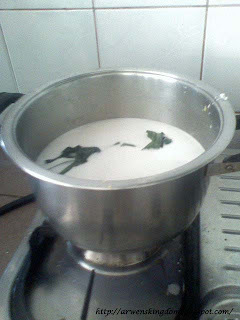 One of the main ingredient too...coconut juice, must be fresh coconut juice so that it smell more good. The first batch of the juice have to keep until the last step it is because it's more fattening and not good if it's over good according to her. 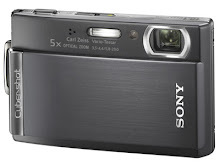 It has to be save and add on till last step. 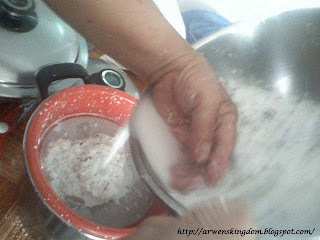 Repeat the coconut juice process for second and third time until it getting less thicker, then put aside. This is the best part that I like throughout the whole process. Making this 'sago', not sure how it call but yeah...just called it 'sago'. Main ingredient for this 'sago' are hot water and corn flour. 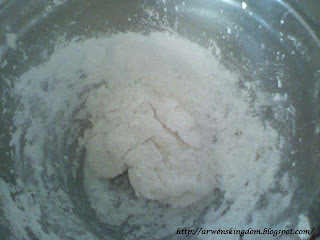 Pour in hot water into this well measure corn flour. Not to be over on the hot water adding, just nice to make it sticky, add more corn flour to make it not so watery as well. 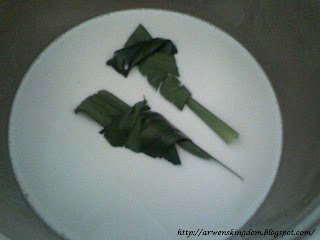 Those green color were the juice that squeezed from pandan leave, more natural taste though. Squeezed the mixtures in hot condition to make it more firm. This is the hard part, you actually have to stand on this hot thing, squeezed it while its still hot!!! Roll it in long shape so that it's easy to cut it into triangle shape. Cut it using scissor is more easier I found. If it stick on your scissor, try to put some corn flour on the scissor or dig it in hot water whenever you found it's sticky on your scissor. 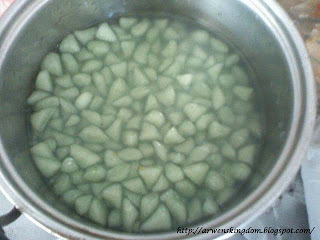 Triangle shape we cut...boiled it until it flood on the water surface, take it out and soak in cool water for pipe. And repeat the same method it you want to do it using other color. Another color we made yesterday...WHITE. No imitate color at all...it's PURE & NATURAL! 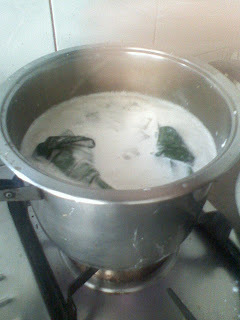 Cook the second or following batch squeezed coconut juice with add on some pandan leave to arouse the aroma. Add in all the ingredients in when it's boiled. 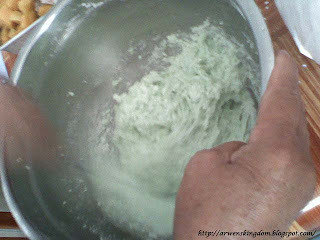 Take out the the pandan leave when its boiling and pour in the first batch squeezed coconut juice and boil it once, don't over boil though...just once right after you add in the first batch squeezed coconut juice. Ta-dah...best serve when it's chilled! Can't really take too much santan due to my gastric problem but it taste goooood!!! Reward after hard work...phew. p/s: Sorry for the inconsistent photos, coz my hands was fulled and needs to work fast...I only can managed to catch some photos before I get scolded. 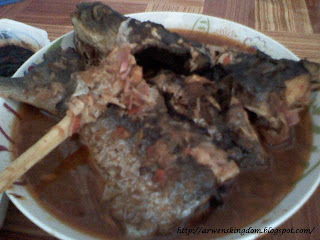 Found this on dining table also...'Pa-Din Fish cook with asam', smell good but didn't taste. Afraid my gastric back if I take spicy. Don't like bubur caca. I prefer ang tau peng!!! Don't like cendol either! LOL!!! waa... see already can feel how nice it taste !!!! 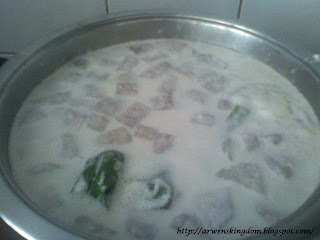 Kenny: The last dish that I mentioned is pa-din fish cook with asam.